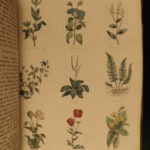 Rare 19th-century issue of the first herbal printed in America! Nicholas Culpeper was a 17th-century English herbalist and physician known for his principal work “The English Physician” – the first herbal printed in North America! This work, which was first published in 1652, contains a plethora of pharmaceutical medicine as well as descriptions of important herbs. Culpeper provides proper preparations for different herbs including anemone, dittany, cottonweed, hemlock, beech-tree, tobacco, rhubarb, onions, garlic, hops, horseradish, mustard, apples, mint, parsnip, wheat, hazelnuts, fennel, oats and parsley, lavender, lettuce, roses, and hundreds more!